Can the Bangladeshi Textile Industry Elevate the Country Out of Poverty? Bangladesh, a South Asian country that can be found bordering India and Myanmar, has caused a circulation of debate around the successes and failures of utilizing globalization as the primary form of modern development. The country had been born into poverty upon its separation from Pakistan but slowly became more financially independent as years went on. The Bangladeshi economy has steadily rose 6% per year since 1996 through its highly important service and agricultural sectors, even though the country has struggled with “political instability, poor infrastructure, corruption, insufficient power supplies, slow implementation of economic reforms, and the 2008-09 global financial crisis and recession”. Much of this economic growth can be attributed to the nation’s export of garments, which has accounted for more than 80% of total exports and exceeded $25 billion in 2015 (CIA). The origin of the Bangladeshi textile industry can be traced back to as early as the official independence of Bangladesh in 1971 when the nation’s newly formed government took control of the textile factories and organized them under the Bangladesh Textile Mills Corporation (Islam et al., 32). Aside from the organizational struggles that resulted from the national takeover of the textile production, there were “problems such as low productivity in the labor force, lack of planning, indiscipline, lack of accountability, and poor machine maintenance and operation resulted in a lack of profit”. This led to the privatization of textile manufacturing, strengthening the quality of fabric being used by factories, and ultimately increasing the global demand for Bangladeshi garments. Rapid growth followed as Bangladesh led an export-oriented garment industry that had originated during the early 1980’s (Islam et al., 33). In a policy paper written by the Danish International Development Agency in 2013, the problems of the Bangladeshi economy were examined, even in the midst of what seemed to be economic success from its booming service and manufacturing sectors. The agency notes that, although the country was successfully able to reduce poverty levels from 57% in 1991-92 to 31.5% in 2010, the country is still considered one of the poorest countries in the world, ranking 146 out of 186 on the 2011 United Nations Human Development Index. Along with the economic growth that has gradually occurred, there has also been an increase in inequality, as well as disparity in wealth between the majority and the minority ethnic groups. Roughly 25%, around 40 million people, are in such poverty that they spend almost all of their income on food and are still unable to fulfill their own basic nutritional requirements. This leads to the next startling statistic that about 40% of children and 30% of women are malnourished, which becomes especially troublesome for households that are led by a female or have no parental care at all (DANIDA, 6). As we can see, the increase in garment exports has decreased the poverty levels in Bangladesh by a significant amount over the last couple of decades, but what about the humanitarian side of this movement? Recently, there have been major concerns regarding the safety and wages of factory workers, considering that only 5% of the workforce partake in trade unions. This is especially startling due to the lack of organization and power of these unions in contrast to the rigid structure of the factories’ management. Widespread corruption has allowed for unsafe buildings to be considered safely regulated due to the lack of staff and equipment by the government (DANIDA, 8). The Spectrum and Rana Plaza factory collapses are the result of the unsafe working conditions for factory workers in Bangladesh. In 2005, the Spectrum sweater factory had caved in and killed 64 workers, yet there had been no upheaval in regulations after that incident. Then, in 2013, a fire at the Tazreen Fashions factory and a collapse of the Rana Plaza factory killed 112 and 1,129 workers respectively. The two main responses from the retailers that have factories in Bangladesh have been to call for more stringent safety codes for these buildings and to work closely with labor unions and workers to receive firsthand account of how to deal with these problems. The Bangladesh Accord for Fire and Building Safety and the Alliance for Bangladesh Worker Safety, each made up of Western private retailers, have begun to inspect the violations against labor in Bangladesh. 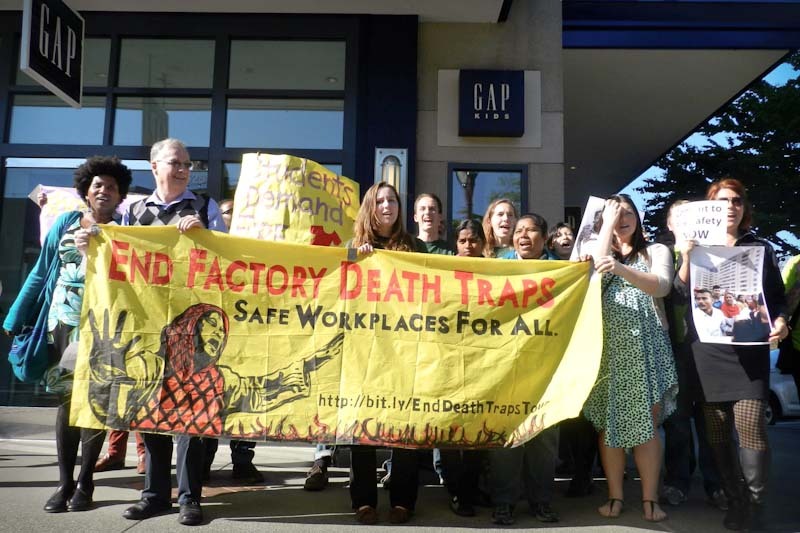 These two organizations have been trying to institute better measures for worker safety in Bangladeshi factories and plan to ultimately inspect 2,000 of Bangladesh’s 5,000+ workshops. On the surface, this looks like a very altruistic plan of action, but the 3,000+ buildings not being inspected generally have worse conditions and there are many secret projects being done in those factories by Western brands (Greenhouse and Harris). Even with these prevalent problems of worker safety in Bangladesh, the garment industry continues to dominate the country’s exports. In 2014, the textile and garment sectors accounted for $24 billion of the $25 billion total goods exported, but the leaders of the industry continue to want to expand its production and increase output. Tapan Chowdhury, President of Bangladesh Textile Mills Association, wants to raise Bangladesh’s ready-made garments and textile exports to $50 billion by 2021 (Ittefaq). As we had done with South Korea last week, we should analyze whether globalization, specifically from the garment and textile industry, has ultimately benefitted the developing nation of Bangladesh. The economic growth is undeniable when looking at the substantial annual increase in GDP due to the dominance of the Bangladeshi textile and garment sectors. Another result of the boom of these exports is that poverty and unemployment rates have fallen. However, despite these benefits of globalization, there has also been an increase in inequality, especially when looking at the economic instability of minority groups which leads to social tension. There has been continuous need to revitalize the labor regulations in Bangladeshi factories, as was seen in the thousands of deaths from disasters that occurred to their workers. This leaves the question of whether the private companies should be the ones left to monitor the upheaval of these newly enforced codes. Personally, I can’t denote whether Bangladesh can be deemed a development success or not due to all of the complications that surrounds its garment industry. Surely, there are many areas for improvement from a humanitarian and labor point of view, but the country has made strides in improving poverty even if there has been increase in inequality. We also will see over the next decade what impact these private retailing companies and development agencies will have on the economy and welfare of Bangladeshi workers. How do you think Bangladesh is going to progress over the next decade? Should it change its current plan to dominate as a garment-exporter? Denmark. DANIDA. Ministry of Foreign Affairs of Denmark. DANIDA. Sept. 2013. Web. Greenhouse, Steven, and Elizabeth A. Harris. “Battling for a Safer Bangladesh.” NY Times. 21 Apr. 2014. Web. Islam, Mazedul, Md., Monirul Islam, Md., and Adnan Maroof Khan. “Textile Industries in Bangladesh and Challenges of Growth.” Research Journal of Engineering Sciences 2.3 (2013): 31-37. ICSA. 15 Feb. 2013. Web. “Bangladesh Plans to Raise Textile Export to $50b by 2021.” Ittefaq [Dhaka] 23 Mar. 2015. Web. “South Asia :: Bangladesh.” The World Factbook. Central Intelligence Agency, 25 Feb. 2016. Web. Posted on March 26, 2016 April 1, 2016 Author Ian LevyCategories Globalization and Development EconomicsTags Bangladesh, Exports, Labor1 Comment on Can the Bangladeshi Textile Industry Elevate the Country Out of Poverty?